Tickets for both of the screenings are on sale now (follow the links above). 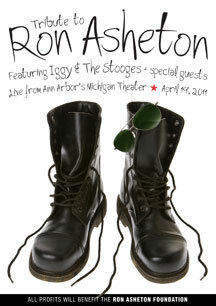 Pre-order A Tribute to Ron Asheton with Iggy & the Stooges on DVD from MVD or Amazon now. Check out the tracklisting and performance of "I Got A Right" featuring Iggy & the Stooges + Henry Rollins below courtesy of Rolling Stone .